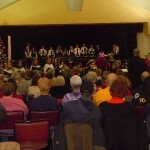 Check out pictures form our Bethel Park Community Center Concert with the South Hills Band and Bethel Park’s Top 21. Great ensembles to share a holiday program! The ringers presented 30 minutes of Christmas music preceding the Lessons and Carols Service. It is wonderful to be able to ring INSIDE during the holidays!